Hello there folks! Today on TechWyse Interviews, we have a very special guest. He is well known in the social media marketing and personal branding industry as a successful marketing consultant and a well-known public speaker. 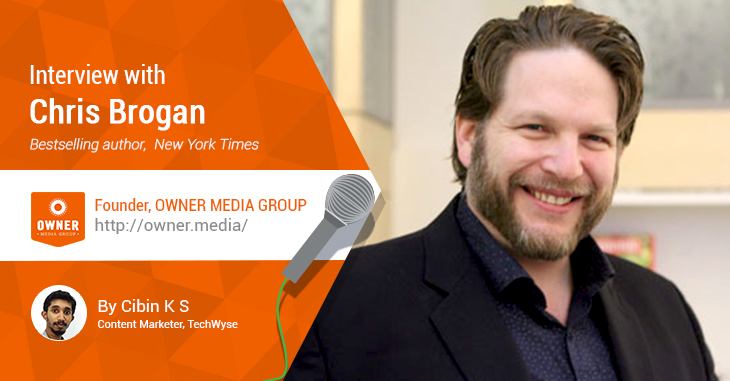 One of the New York Times bestselling authors, Chris Brogan has consulted with companies like Microsoft, Google, Disney, Pepsico, Sony and many more! Q: Let’s start at the beginning, Chris! When did you realize your talent for writing and that you would become a multi-book author? A: I started writing when I was a little kid. Badly. And then I wrote even worse through the rest of my life until I started journaling in 1998 (what became blogging). I guess I figured out that I’d be a multiple book author once I got the deal for the second book immediately after the first one hit the New York Times and Wall Street Journal bestseller list. Q: In a podcast on Copyblogger, you said that you are writing about 2000-4000 words daily. How do you find the topics for your daily writing needs? A: I never run out of topics. I come up with 10 topics a day, every day, as a matter of habit. I will never get to all my topics before I die, so there’s that. Q: You are an admirable person for every budding blogger and copywriter. Most people start blogging because it’s a good way to earn easy money, but only a few of them are doing this with passion. What is your perspective about blogging for money vs. passion blogging? A: I don’t see blogging as a way to earn easy money. Maybe I’m just not that good at it. There just seems to be an abundance of content out there that’s junk. I can’t presume it makes anyone much money. Maybe in the old days but not now. Q: Content style and strategy are changing day by day along with the way the user consumes the content. As an around the clock experimenter in content development, can you tell us about the latest trends in the content we might not expect? A: No one is paying attention anymore. Everything’s fast and bulleted and bite-sized. To that end, I’ve been coaching my content makers to think about “tapas” content marketing. How do you craft the perfect bite? That’s what I think is next. Something that looks good, tastes good and leads you to some kind of a meal. Small isn’t the answer. Cheap and fast aren’t the answers either. A well-crafted bite is what people need. Q: From Facebook to LinkedIn, all social media channels have leveraged video in their feeds, and their algorithms are changing to give maximum visibility to more visual content, like videos or vlogs. What is your take on the future of text vs multimedia content? A: Video is pretty important. If you’re not spitting out a bit of video weekly, you’re missing a powerful trend. YouTube hours viewed in 1 day? 1 billion hours. How much of that is on a TV set now? 100 million hours. That means 100 million opportunities to get seen on someone’s TV without needing a TV network. Yes, make a video. Q: What is your biggest challenge in adapting to new changes in technology, and what steps do you take to overcome it? A: I guess the only challenge I have is to make sure I don’t run off and follow every shiny thing that comes along. Tech for tech’s sake is rarely interesting or worth it. But sometimes, you run the risk of getting behind. Most times, my bets pay off. For instance, I don’t give a damn about Snapchat. Still, don’t. But unless they’re selling you a course on how to get better on Snapchat, I can’t point to many business people making loot from it. Q: As an influencer in digital marketing, you get tons of emails daily. A cold email is powerful for connecting with new people to closing the deal. I bet you have some great stories that are examples of this. Care to share a couple? A: A cold email can be horrendous. I have to tell you, the one detail that most people sending me a cold email fail to realize is that I’m sent HUNDREDS of emails a day. Of these, maybe 20 are something I really want to open. I’ll open almost anything, or at least read the preview pane, but I only want 20. Of the rest, I see all the trends. I see them because hundreds of people are trying them on me. The old “read the last two blog posts and comment specifically about them?” A million times. That situation where you think you’re asking me a “quick question” for your crappy roundup post? I’ve been asked about 12 times a day every day. While it’s flattering, it’s also a sign that you’re a bad content creator. 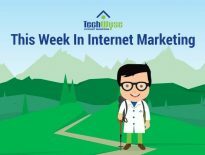 Q: Most of your new blogs resonate the sound of the future.Whether it is about flying cars or robot doctors. Do you think automation will be bad news for us digital marketers? A: I think automation will do what it does in every opportunity to use it. People will use it poorly, or they’ll learn how to treat automation as a way to allot more time to devoting attention to people specifically. In a copy/paste world, there are ways to keep everything very personable and friendly. Q: When it comes to lead generation and finding new clients, most companies are using Linkedin. Linkedin has changed from a professional network, to a proper yet effective marketing channel. Can you tell us some Linkedin hacks and tools that you use? A: My newsletter is my favorite method for marketing. Beyond that, on other people’s soil. LinkedIn is okay, I guess. I don’t have very many hacks. I just did whatever John Nemo told me to do. He wrote a book and has a course called LinkedIn Riches and both have good advice for it. My advice? Be a damned human. Q: ‘Chris Brogan and Julien Smith’ sure sounds like a deadly combination. Can we expect anything new from you guys in the near future? Thank you, Chris, for taking the time to answer my questions, and providing us with some great insights and sharing your experience. Thank you Cibin for your efforts here, the questions you have asked is very relevant and Worth reading this blog.